SideFolders gives you instant access to your devices, places, shared folders, downloads and recent files. But also to files and folders you have added to SideFolders. Just move your mouse to the edge of the screen and SideFolders pops out. Stop looking for the same files over and over again. Just add them to SideFolders and access them at the flick of your wrist. SideFolders allows you to drag and drop files to and from any application without losing focus of the application you are working with. Organize your files in a logical hierarchy independent of your filesystems hierarchy. Easily access often-used files, folders, apps etc and keep them off the desktop. A couple of tips: The SideFolder window can be resized by grabbing the edge of the window and dragging. Items inside the SideFolder window can be renamed, removed or trashed by selecting the item and holding down the “Control” key. Quick response from the app’s author when I needed help. Highly recommended. Really useful utility - would like one feature. 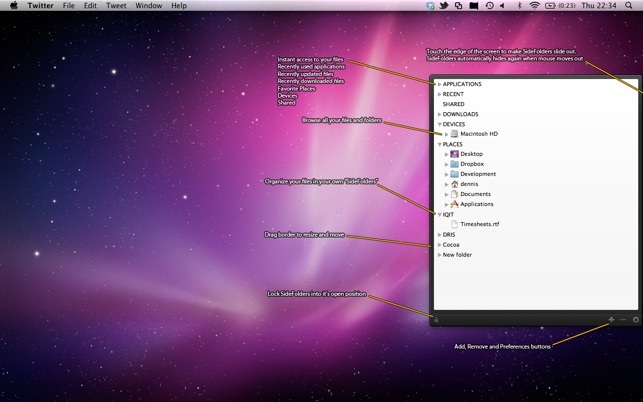 I really like this app - it’s a great way to keep a specific collection of apps, files, etc. handy, and I use it daily. It would be nice to have a sort-by option that allows the contents of folders to be sorted by name, date added, location, etc. Add that in, and I’ll gladly add a star!